What would you do for someone you “love”? Is it really love? Or a dark obsession? 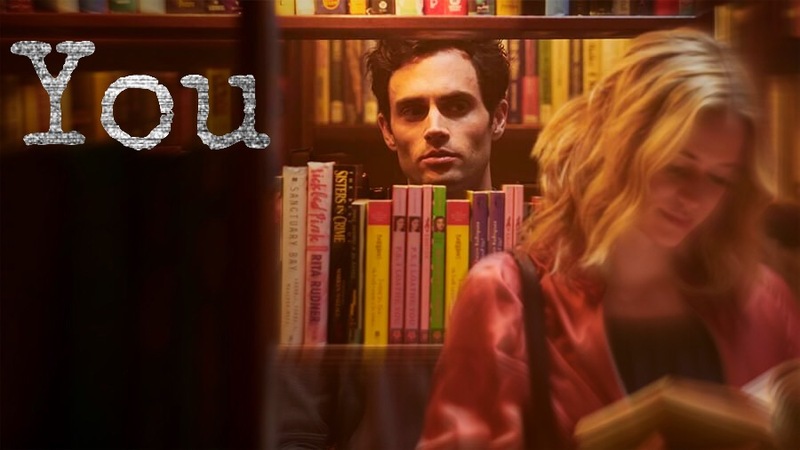 These are the questions you’ll ask yourself when you watch Netflix new chilling series “You”, based on the book by Caroline Kepnes. Staring “Gossip Girl’s” Penn Badgley as charming psychopath Dan Goldberg and Elizabeth Lail as Beck, the show has the A-list acting down pat. It all starts in New York City where a shy bookstore owner (Joe Goldberg) crosses path with a beautiful aspiring writer (Beck). Now if you’re thinking that this will be a Hallmark love story, just wait until you find out how Joe “crosses paths” with Beck. From the moment of their first encounter in the bookstore, Joe immediately cyber stalks Beck on all her social media platforms to find out everything and everyone that is important to her. Just an awkward crush? As if that isn’t invading enough personal space already, Joe finds out where Beck lives and watches her through her apartment windows. The plot really picks up in the second episode,“The Last Nice Guy In New York,” when Joe follows Beck out one night and saves her from getting hit by a subway. This is when their “love story” picks up. Beck is so grateful for Joe saving her that she sees potential for him being her next boyfriend. As if stalking isn’t enough, when Joe meets Beck’s rude boyfriend Benji, he makes it clear that he that he will remove any obstacle–including people–that stands in his way of getting to her. If you’re thinking about what happens to Benji, just think “bye, bye.” This isn’t the only character Joe eliminates in the show. He also gets rid of Beck’s pretentious, rich best friend Peach Sanglier. He feels like Peach only wants Beck to herself and is trying to keep him away from Beck. Joe will definitely not let anyone convince Beck to leave him. From this point on, things dramatically intensify. Once you finish season one, you will be counting down the days until season two is released. Full of mystery and nail–biting moments, “You” is definitely for someone who enjoys a good thrill, at least it was for me. It also sends out an important message to viewers: being obsessive doesn’t equal love. Living in the world we do today, the abuse rate (abusing emotionally and physically) sadly tend to grow dramatically. Many people don’t usually see the signs of an abusive relationship. These signs include obsessive behavior, manipulation, and stalking. Of these three signs, Joe demonstrates all of them. Joe Goldberg may seem like a perfecting charming suitor with plenty of chivalry, but when we find out his true intentions, we beg to differ. I think this show can warn people of all ages to look for the signs of abusive relationship. Not only will they be able to see the signs, but they will also be able to get out before things harmfully escalate.